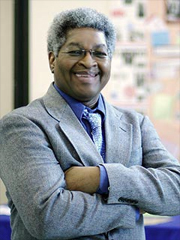 History instructor James S. Harrison is based at Portland Community College's Cascade Campus.Considered as an expert in African-American history and issues, Prof. Harrison is well-respected for pioneering a number of ongoing social science courses in the PCC system. Before coming to PCC, he taught social sciences at three Portland Public Schools for 18 years and even served as the principal of a Catholic grade school. In his own words, he talks about his passion for teaching. I think that I have one of the best jobs in the world because every day I get to do everyday something that I like. It’s hard work but it’s enjoyable to take part in engaging the minds of students and seeing them wrestle with new concepts. One of the most joyful things about teaching history is helping students see that history is not just about memorizing dates. History is about looking at the lives of people whose decisions continue to affect us. Historiography is important in putting those decisions into their historical context. Students get to know that people who lived in a different time s lived by different values. Telling stories is an important part of my teaching approach. I throw out scenarios that students discuss, and I try to get everyone involved in the learning process. Every one of us has a bit of wisdom – we can all learn from each other. I have pioneered a number of courses here at PCC. We’re proud of the fact that PCC is the only college in the country that offers a coordinated sequence of courses on African culture: art, history and literature. I initiated a Mexican history class that is offered regularly. Our goal is to expand our students’ experience in the human condition. We’re all different, and in this 21 st century, we’ve got to live together. The best way to do that is to learn from and about each other. This year, we I started another class on “Race and Racism.” This was the first time that I started a class that began with a completely full enrollment. There was tremendous enthusiasm from the students. They have told that they’ve come away with a different understanding of race. When asked how old racism is, many students reply “as long as humans have existed.” The shocking thing for many students is learning that racism has only existed for only about 200 years, since the concept of race was established to classify and rank people. A lot of students tell me that once they found that racism began at a certain time, it gave them the hope that racism can end. It’s not something that is part of the human condition. We also examined the idea of a colorblind society. Most people react to racism by claiming that they do not see color. But being colorblind is also being racist. Because it basically “pretends” that there has absolutely been no difference in treatment. You’ve got to recognize and acknowledge past mistreatment in order to correct. Students also learn about standing up against racism. Many are already doing that in their own way, but now they have more of a context that gives them the confidence to address issues that arise. I challenge this notion that with the election of President Barack Obama, we now live in a post-racial world. I was a supporter of Barack Obama – I supported him because I thought he was the best candidate. I thought that the programs he enunciated where ones I could enthusiastically follow. We’re definitely at a better place than we were when I was growing up in the 50s. It’s a wonderful accomplishment, and it’s an indicator that we’re moving toward a post-racial society, and perhaps a lot faster than people have thought. But to say that his election means that America is “post-racial” is completely misguided. We are still in a very racialized society. The fact that you have one person of color who rises to success indicates that more and more people are making decisions based on qualifications, rather than color. But it doesn’t mean that in day-to-day life, people are experiencing wide-scale changes. I first thought of teaching when I was in the ninth grade, attending school in the New York City public school system. I had a quite a few inspiring teachers, and I thought it was a great profession. I had considered becoming an architect, an engineer, but teaching really appealed to me. When I was in junior high school, we had a class activity that involved corresponding with other students in different countries. I started corresponding with this student in Sierra Leone, and kept in touch with him through college. I was a junior when the Peace Corps came to the Hunter College campus to recruit. I attended the information session, and thought it was a great opportunity to go to Africa. I was accepted into to the program and applied to go to Sierra Leone. Going to Africa was like going back to my roots. When I arrived, it was very different from what I had expected. I grew up watching television series based on Africa. That was when I came to the realization that even though I was a college graduate, those childhood images about Africa has had stuck with me. This was during the war in Vietnam, and there was a lot of anti-Americanism going around. Some of the Africans I met did not like what our government was doing in Southeast Asia, but the people we met were wonderful to me as an individual. Being a Black American Peace Corps volunteer in Africa caused a great deal of interest among the people I met. Most of the volunteers were white. There were about 89 in our training group, and only about six of us were Black. I taught secondary school in a small village in Sierra Leone. The students in high school were considered “superstars” in their village because they’re in school aspiring to go to college. I was considered an immediate “role model” just because I had a college degree: here was someone of the same hue who has achieved a college education and in America no less. I lived among the Mende in Sierra Leone, and one of the things I took with me is their lifestyle. Living each day, one day at a time. Whatever you do, this is the day to do it. When tomorrow comes – if tomorrow comes – it’s a gift and another chance to live another day. I also very much appreciated how candid and honest the Mende people are. That stayed with me to this day. I always strive to be as honest as I can. When I was working for the Public Library in New York, I came across this book titled “I See By My Outfit” – it was about these two guys from the Bronx who took a trip across the country on Vespa scooters. I was fascinated by the idea, so I planned out this impossible two-week trip from New York to California, and back. It was an awful plan, but that got me thinking that I haven’t seen this country. I was born in the South, raised in New York, and hadn’t seen the rest of the country. Before I came back from the Peace Corps, I decided that I wanted to live in a different part of the country. After the Peace Corps, I stayed in New York for four years. I saved enough money that allowed me to travel around the country for a whole year, and that’s what I did. I visited family in South Carolina, and traveled across the South, visiting places I’ve never been to before. I went to Montgomery, Alabama, and talked to some people who were there during the Montgomery boycott. Stayed in Atlanta, Jackson, Mississippi, Minneapolis, Colorado, then finally: Oregon. I stayed with a family that I previously met in Sierra Leone. They were on vacation there while I was back in Freetown conducting research on my master’s thesis on the Sierra Leone wars of 1898. We later corresponded, and they extended an invite to stay with them if I was ever in Oregon. I ended up staying with them in Astoria for about a month. What I realized was that you never really know the country until you travel it by road. You meet so many different people. I stayed at the Y’s (YMCAs) mostly. Nearly every place that I went, I felt that this was truly my country. Meeting other Americans and seeing how people live allowed me to experience our diversity first hand and left gave me with a really good sense of what this country is all about. "History is about looking at the lives of people whose decisions continue to affect us." "Being colorblind is also being racist. Because it basically “pretends” that there has absolutely been no difference in treatment." "The fact that you have one person of color who rises to success indicates that more and more people are making decisions based on qualifications, rather than color. But it doesn’t mean that in day-to-day life, people are experiencing wide-scale changes."